The Alternatives Report introduces three distinct land use alternatives and presents evaluations of those alternatives based on a variety of criteria. ThePublic Review Draft Alternatives Report will be presented at an upcoming Community Workshop. 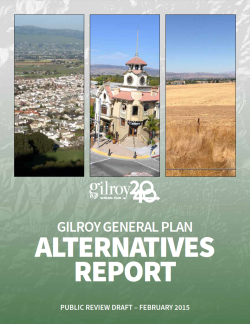 This edition of the newsletter presents three citywide land use alternatives and summarizes some of the findings from the Gilroy General Plan Alternatives Report. The Alternatives Report introduces three distinct land use alternatives and presents evaluations of those alternatives based on a variety of criteria. The report also describes the public input and GPAC decision-making process involved in developing the GPAC-preferred alternative. Finally, the report evaluates the GPAC-preferred alternative on several criteria. The GPAC-preferred alternative will be presented to the Planning Commission and City Council for review and approval. On February 25, 2015, the City of Gilroy held the fourth community workshop on the New General Plan. The purpose of the workshop was to get the community’s input on the development of a preferred land use alternative. This report provides an overview of the workshop activities and a summary of the public input. The City of Gilroy Housing Element addresses housing opportunities for present and future residents through 2023. The Policy Document outlines the City of Gilroy’s goals, policies, and implementation programs for the preservation, conservation, improvement, and production of housing for the 2015-2023 planning period. The Housing Element identifies the specific action the City will take to address existing and future housing needs. This edition of the newsletter presents the three alternative land use concepts and summarizes some of the findings from the Gilroy General Plan Alternatives Report. This document introduces the three draft land use alternative concepts, including their extent of urban development, new land use designations, and policy concepts. The document contains the three land use alternative diagrams. This Initial Study provides environmental analysis pursuant to the California Environmental Quality Act (CEQA) for the proposed City of Gilroy Housing Element Update. On June 21, 2014, the City of Gilroy held the third community workshop on the New General Plan. The purpose of the workshop was to consider future growth and land uses for Gilroy. This report provides an overview of the workshop activities and a summary of the public input. A vision is a description of an ideal future for the community to work towards. Guiding principles express the key values and aspirations for Gilroy’s future and serve as guideposts for the goals, policies, and implementation measures contained within the General Plan. These principles expand on the main ideas contained in the vision statement so that important concepts are given more weight. The vision statement and guiding principles will be referred to throughout the process, particularly when choosing a preferred growth alternative. All goals, policies, and implementation programs in the General Plan should be consistent with the vision and guiding principles. The third edition of the General Plan newsletter promotes the June 21 Community Workshop, presents the Vision and Guiding Principles, and highlights new documents published since the last newsletter. 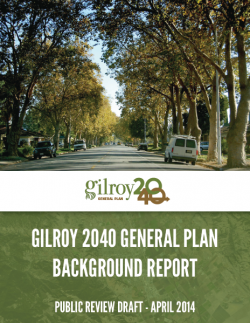 The General Plan Background Report takes a “snapshot” of Gilroy’s current conditions. It provides a detailed description of a wide range of topics within the city. This report provides decision-makers, the public, and local agencies with context for making land use and policy decisions, and is intended to be objective and policy-neutral. On April 2, 2014, the City of Gilroy held the second community workshop on the New General Plan. The purpose of the workshop was to develop a vision for the future of Gilroy. This report provides an overview of the workshop activities, a brief summary of the public input, and an appendix that contains all public input received. The City of Gilroy Housing Element addresses housing opportunities for present and future residents through 2023. The Background Report analyzes the constraints, needs, and site available for housing. The background report also reviews the accomplishments of the previous Housing Element. The second edition of the General Plan newsletter promotes the April 2 Community Workshop, provides a summary of the “A Community Conversation about Gilroy” document, and provides an update on the EDSP. This document summarizes the community input given during the first months of the General Plan Process. The input is organized by theme, with an emphasis on reporting the community’s input on Gilroy’s issues and opportunities. The Economic Development Strategic Plan (EDSP) provides a vision for economic development in Gilroy, an action plan for implementing the vision, and growth trends for a variety of industries. At its core, the EDSP outlines the City’s 5-year strategy for attracting, growing, and retaining jobs in Gilroy. The City Council accepted the Economic Development Strategic Plan on February 24, 2014, and the Council identified their initial implementation priorities, consistent with the recommendations found in the staff report. As a next step, staff will return to Council with a recommended economic development work plan including priorities, accomplishments, next steps, and timing. The first edition of the General Plan newsletter provides information on the Town Hall Forum, the GPAC, and the General Plan process. This General Plan was adopted in 2002 and sets the goals and policies that form the basis of land use decisions. 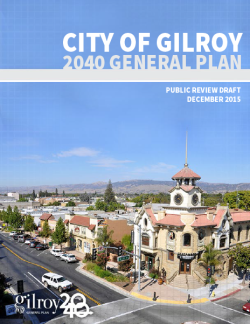 Once the Gilroy 2040 General Plan is adopted, this plan will be archived and no longer in effect. Adopted in 2012, this housing element will be replaced as a part of the Gilroy 2040 General Plan process.